This blog is now located at http://blog.alwaystri-ing.com/. Prove yourself once again in 2010 at The North Face® Endurance Challenge. From undulating hills to elevating peaks, technical East Coast trails to mesmerizing West Coast views, The North Face® Endurance Challenge offers a unique running experience for everyone. Introducing a two-day format and new race distances in 2010, each market will feature a wide array of trail running adventures. Never stop exploring your potential. A serious, hardy test for trail runners of any level, The North Face® Endurance Challenge at Bear Mountain, NY, takes place on the western shores of the Hudson River, in the craggy foothills of the Catskill Mountains. 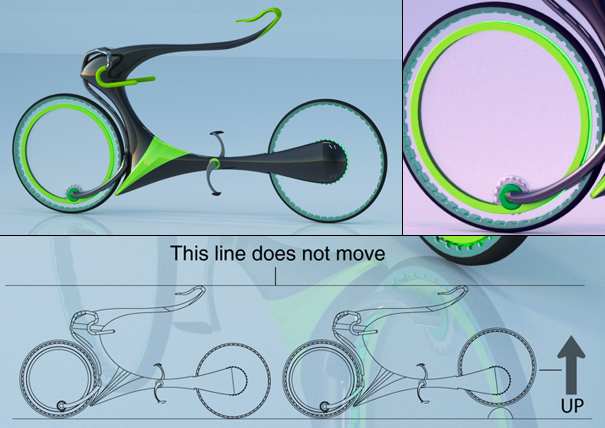 Got to love it when bikes are redesign, whether practical or not. This design by Hoyoung Lee, Youngwoo Park, and Jungmin Park. Lemme do a quiz on you, bikers. How well do you love gravity? Not? I really hate it man, it’s terrible. So here’s the thing: you’re in luck. There’s a bike right here that defies it. Like a standard rebel. It’s called “Flying Bike” and it’s quite the magnetic levitator. By using the impetus of the bicycle, power is generated and magnetism brings the back of the bike up, up, up, until the gear is literally in the center of the back wheel, unconnected by anything other than the powers of the magnet. The the magnet is strong! Kinetic energy brings the back of the bike upward as speed increases. This allows for decreased wind resistance and absorption of impact from bumps, stones, squirrels, etc. But wait, isn’t that a sort of gear situation I see on the back wheel? Does that become dissipated once the bike goes fast enough to lift off the ground? Yes! There is a point where the force changes. This is similar to what happens in the front, but with a much smaller gear. The biker’s gonna have to get used to this sort of situation. One drill which offers a great learning opportunity for this is called the Rollover Drill. This drill forces athletes to find this pressure and apply it in their stroke. What better way to get used to the open water than to join a group when they come to your area. Better yet one that will help you on stroke technique. Rob Aquatics traveling to a site near you. "Tough Mudder is the TOUGHEST one day event on the planet. This is not your average mud run or boring spirit-crushing road race. Our 7 mile obstacle courses are designed by British Special Forces to test all-round toughness, strength, stamina, fitness, camaraderie and mental grit. Forget about your race time, simply completing the event is a badge of honor. Not everyone will finish, but those who do make it to our post-race party will have truly earned the right to call themselves a Tough Mudder." One of the best places to go besides CrossFit is Monkey Bar Gym. They too have the WOD but they also have a store to buy the products they use. Body ESP (endurance, strength, power) instructor led class unless of course you're training on your own:), do an ALL OUT set, rest 15-30 seconds, a bit longer if you need, get some water, write down what you did, then do next exercise. do as many as possible reps at each station, keep track of reps.
FORM IS SUPER STRICT, 2 count up (breathing out), 1 second pause at top, 2 count down (breathing in), 1 second pause at bottom, repeat all reps this way. GOAL IS ALL SETS ABOVE 10 REPS MINIMUM, UP TO 30 REPS, IF YOU THINK YOU CAN DO 30+ REPS, MAKE IT HARDER!! GO TO NEXT LEVEL OR ADD MORE RESISTANCE!! Now you have no excuse, hey use the time to network with others that are out of a job, some of the best ideas and friendships come from time like these. This is the most outrages piece of unsportsmanlike footage that you will ever watch. A ban for life should follow. Moving at 30+ mph and then through into a metal barrier could have killed Darril Impey. Theo Bos from Rabobank went out of his way from behind to grab Darril and toss him into the barier, the best thing was that there was a camera rolling and the commentator saw it unfold before it happened. Nice Rack! Bike Rack That is. There are a lot of car bike rack companies, Thule, Rocky Mounts, Yakima, all work very well and have been in business a long time. Then one emerges as a little different and take what is good about those racks and rethinks it, Kuat Innovations has done that, making light (11 pounds), sturdy, quick, easy to fold up, and has functions built in (bike lock, hitch lock) that other don't. One of the best features is the ability to adjust based on the frame size and to clamp against the frame allowing a more sturdy carrying position. hey bikes get updated yearly, maybe its time for your rack to get the same treatment. Kick/Swim Workout, started with an easy 400 warm up, then went into a 800 pull no paddles. Then 10/50 under/overs per 25 on the 1 min, then 5 100, on the 2 min, a 400 easy after that with a 100 warm down, not much to say the cold and run/bike seems to be getting to me. I chopped wood for 2 hours and stacked it, felt this would be a good all body workout and I was right, sore. So it is full on, into training we go, so did 7.5 miles on the tread started the usual 7.5 mph (8 min miles) then stepped it up with 10 min with a 4% incline same speed then back down and finished it with 7:28 miles. Felt good not that tired but really ramped it up at the end. The bike was on the trainer and it felt much better than the spin bike, did that for a hour, watched last years Ironman got me through it since it was 20 degrees out. SNOW and COLD, well this is one way to see if you can go 8.8 miles. So it snowed and then iced over, so each steps was a little like skating but really worked the stabilizer muscles. Once you pushed off your foot would go a little further. But allin all was ran for 1:13:18, for 8.8 miles supper cold 22 degrees so it turns into 8 min+ mile. Did not feel tired and could have kept going so that is a plus. I spent 30 min in my red zone pushing it in some spots and 35 min in my good zone. Spin bike, this is where you see if you can make it, get through the first two weeks inside and the rest will go smooth. So 1:28:00 roughly 30 miles tough go but got out of the sadle and started to mash the big wheel. Good article to read about training inside, on Active. Ok Run Tomorrow and it looks like a cold and snowy day. Ok felt in a rhythm ran 7 miles at 7:30 second run and this seems promising and a good start. At roughly 6 miles I started to increase from 8.5 up to 10.5 with a 11.5 sprint at the end. Really the only good thing about the tread is that you can increase and decrease the speed and incline anytime. One thing that I don't want to lose is my sprinting speed so doing a increase in speed is important. I think that I will do a quarter mile increase then a quarter mile normal, see how I can push the limits. The spin bike was 20 miles in a hour so 20 mph not bad and looks like a good start I would really like to be able to start with 20 mph to begin the season and get into the 24 for races even higher since I ended the season with a 24.5. So I did some ups and downs, hard resistance and easy warm up and warm downs, but the spin felt good. Now Need to really start to look at my diet and fluid intake. So got in the water, I am trying different things like eating breakfast and not jumping in the water at 5 am. So I waited had breakfast a coffee, and FRS Plus, I love this stuff. Then I headed to the pool, no one there, swam a easy 100 then went the full 1600, took a little longer than expected 30 min but after not swimming for 2 months not bad, then a 400 pull set. The swim felt good muscle a little tight and more stoke feels short, still a good swim. Then did a good set of kettlebells. Good day but tired. So we are really in full swing, ran 7 miles on the tread, that is the worst but good for sprints and hills. I went for 54 min that is a 7:30 pace around, not great but not bad for and easy day, did some sprints at the end for a half mile at 10 mph. Went home and rested, ate and then biked 20 miles. Yes it was on a spin bike, I think I will do that this week then switch to the trainer and/or rollers. Over all it felt good to be in a routine again and think that I am a better position this year than were I was last year. Swimming and lifting tomorrow, oh my watch had to get new batteries so i can't give great stats till I re-calibrate the foot pod. Got back in the pool today, after 2 months off. Felt good a bit cold and after about 1000 yards I was feeling it. Went for about 40 min about 1500 yards I was trying to to keep track. Did a little of everything, kick, pull and sets. I was a little surprised that more people where not at the pool but a free lane to myself is always good. Will do a kettlebell workout later in the day as well. Trying to stay on course with weights through the whole season.